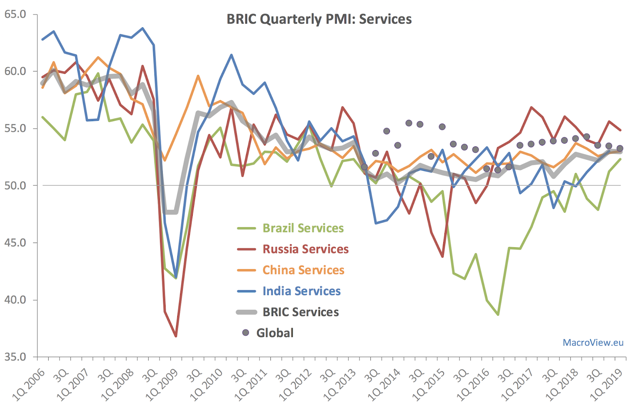 Q1 2019 Services PMIs for BRIC economies came in signaling no change on 4Q 2018 and converging to the Global Services PMI reading. Brazil Services PMI averaged 52.3 in 1Q 2019, a gain on 51.2 in 4Q 2018. Russia Services PMI average for 1Q 2019 was at 54.9, down from 55.6 in 4Q 2018. Brazil Services PMI averaged 52.3 in 1Q 2019, a gain on 51.2 in 4Q 2018, and the highest quarterly reading since 1Q 2013 when it stood at exactly the same reading. Russia Services PMI average for 1Q 2019 was at 54.9, down from 55.6 in 4Q 2018, signaling moderating, but still fast pace of growth in the Services sectors of the economy. China Services PMI was at 53.0 in 1Q 2019, a marginal improvement on 52.8 reading in 4Q 2018, but still substantially down on 53.7 reading in 1Q 2018. India Services PMI was at 52.2- a slip on 53.0 recorded in 4Q 2018. Given past weakness in Services sector in the Indian economy, 52.2 reading is still respectably tied to the second-fastest growth for any quarter since 4Q 2016. GDP-weighted BRIC Services PMI averaged 53.0 in 1Q 2019, the same reading as in 4Q 2018 and signaling marginally faster growth than 52.7 reading for 1Q 2018. Meanwhile, Global Services PMI averaged 53.2 in 1Q 2019, down marginally on 53.4 in 4Q 2018 and marking the third consecutive quarter of declining growth in global services economy.